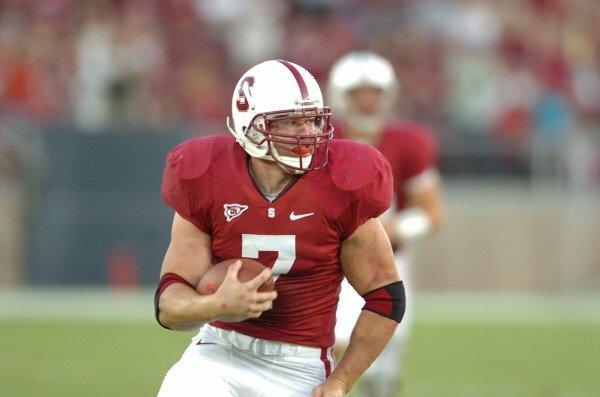 The following is an excerpt from The Daily’s upcoming book, “Rags to Roses: The Rise of Stanford Football,” by Joseph Beyda, George Chen and Sam Fisher. The book will be sold electronically starting on July 15, and we will publish excerpts every Friday, including today’s installment on the 2009 season. Scroll down to the bottom of the page to sign up for updates on ordering information and future excerpts. With a 42-21 lead and 10:29 to play, most teams would be content to just run out the clock. The Cardinal stuck to the ground the rest of the way against USC — but not because it was done playing football. Stanford had exhausted its rival’s defense, and the Cardinal was going to take advantage with its trademark: power. On first down, sophomore right guard David DeCastro pulled as senior running back Toby Gerhart crashed for 2 yards on the left side. On second down it was DeCastro pulling again, paving the way for a 7-yard Gerhart gain. That’s when, as the Cardinal lined up for third-and-1, a Trojan defensive lineman spoke up to senior center Chase Beeler. Andrew Phillips pulled, Owen Marecic took out his man and Gerhart bounced outside for a 29-yard gain. Stanford ran power three more times as Stepfan Taylor and Gerhart moved the ball 65 yards on just six plays. After Gerhart punched it in on his 29th carry of the afternoon, he jogged calmly back to the sideline as usual. The next thing he knew, Taylor was running onto the field as Jim Harbaugh shouted for a two-point conversion. Confused and exhausted, Gerhart asked his coach what was going on. “I want to put 50 on these motherf***ers,” Harbaugh replied. Taylor was stopped just short of the goal line and ran off the field to a chorus of boos. But Stanford’s players were on the same page as Harbaugh. And Stanford still wasn’t finished. As USC fans filed out of the Coliseum, redshirt senior safety Bo McNally intercepted Matt Barkley’s pass on the Trojans’ first play at almost exactly the same spot of the field that he had picked off John David Booty to end the game in 2007. With one more nostalgic touch, Harbaugh put fifth-year senior Tavita Pritchard back in the game to continue the Cardinal’s onslaught of power. It didn’t matter the down or the distance; play after play, DeCastro or Phillips was pulling across the line. “We would call power, we’d kill to power and then we’d alert to power,” Beeler jokes. Tyler Gaffney would eventually score from 1 yard out to make it 55-21 — Harbaugh had his 50 — but by that point, it was all about the Tunnel Workers Union. On its last two scoring drives, Stanford had run power on 12 of 13 plays and utterly beaten back the Trojans’ first-team defense. By the time sophomore quarterback Andrew Luck took the game’s final knee, there was hardly anyone left in the Coliseum. Stanford had conquered Troy. “Just rotating 360 degrees and seeing nobody, no fans, that was awesome,” says then-sophomore safety Delano Howell. USC head coach Pete Carroll wasn’t so happy. Stanford had just scored 55 points, more than a USC team had ever allowed in a single game, and Harbaugh had clearly tried to run up the score with the fourth-quarter two-point conversion. So as the seven-year Trojan dynasty crumbled around him, Carroll got in a parting shot as the coaches converged for their postgame handshake. “Nice game,” Carroll said before walking away. Harbaugh had always been one to go after the man on top; the Trojans found that out the hard way in 2007. But when Harbaugh stood up to Carroll at midfield that afternoon, it was clear that the pecking order had changed. Contact the authors at ragstoroses@stanforddaily.com.